On the night of 23.08.2017, we received a snake rescue call on a property from the village in which we work. We were informed that the boy who lived on the property heard their chickens were in distress. On inspection of the chicken coop, the boy found a cobra has envenomated one of the chickens. The boy had startled the snake as it had hooded at him and then made an escape. Once we arrived at the scene, the chicken was found to have been bitten on the face and had to be euthanised at the scene to prevent any more suffering. A lot of effort was put into finding the snake by inspecting the property thoroughly by digging out any holes which the snake may be hiding, yet there was no luck. We informed the residents of all information needed in case they encounter another cobra and told them do not hesitate to ring us if any snake returns. The following day we received another call from the same residence saying a cobra was on the property. On arrival it was found that the cobra had returned to the exact same chicken coop. However, this time the snake had chose a toad as its meal, rather than chicken. The snake noticed us and tried to make his escape, still with the toad in its mouth, but in its rush hit a wall and dropped its prey in the process. This enabled us to capture the snake and the toad. Remarkably, the toad survived for over 10 hours after envenomation. Snake is a healthy adult male of Indochinese Spitting Cobra Naja siamensis. After good amount of outreach local villagers were happy to hear about our project and allowed us to visit their property any time we need to radiotrack our snakes or look for new ones. Additionally they were persuading their neighbors about importance of our work in the village. LOVE IT. With a lot of hard work and help from our short term intern Kawinwit Kittipalawattanapol, otherwise known as Ink, the project recently produced a new leaflet. Aimed at the villagers around the station, the pamphlet not only introduced the projects goals and aims, but also included important information on commonly encountered snake species in the area and snake bite first aid. Once completed and printed, the next task was to get out into the village and hand them out. After some hard bargaining we managed to enlist the help of our two young thai speaking friends Leo and Hans, the sons of Bart’s PhD co-adviser Dr Jacques Hill, for the hefty price of a double scoop ice cream each. So with the deal made we headed out to meet and greet our neighbours and get the word out. Over the last few months we’ve had a decent number of Indochinese Spitting Cobras captured within the rural areas of Sakaerat Biosphere Research Centre. Things are a bit different with Monocled Cobras, which are found mainly in forested areas and are harder to encounter. That is why it was great news when one of our fellow researchers (Katie and Wyatt) noticed a big individual in the plantation forest. The large male was crossing a dirt road before he was spooked by the researchers and retreated under a rock. It took a while but with the help of our colleagues Curtis was finally able to dig him out and capture him. 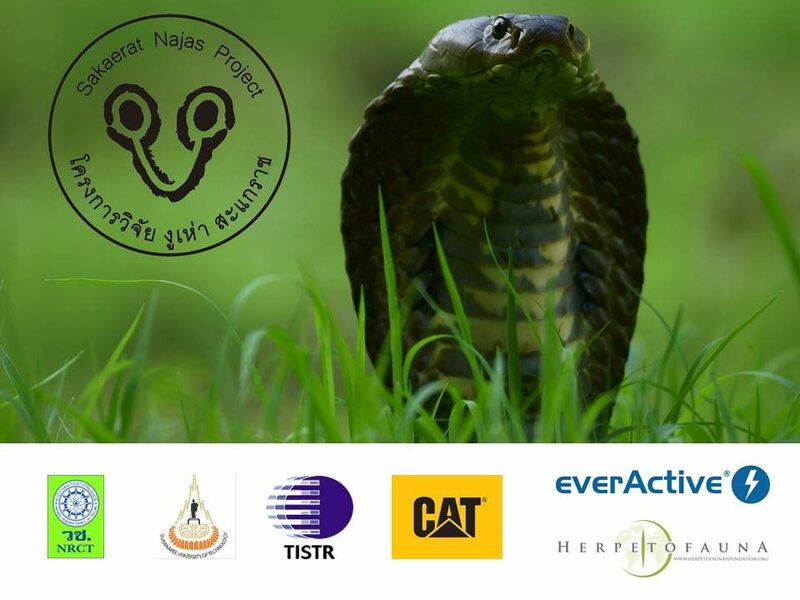 Naka021 proved to be the second biggest cobra we have had in our project at 1.5 kg and 1.75 m long. This individual did not like to be handle at all and I must admit, it was the most ballsy kaouthia I ever worked with. this snake spat twice during our planned photo session. Because of its attitude photos in studio were not possible, but luckily we managed to get some shots during the release of this magnificent individual. As fare one of ours grates conservation efforts – developing skills of Thai people. While King Cobra breeding season is in its peak, recently at Sakaerat Najas Project we had great pleasure to conduct together with คณะวิจัยงูสะแกราชฯ – Sakaerat Conservation and Snake Education Team another snake handling training for the local Rescue Teams. These units are made of volunteers that normally use self-made snare poles that can easily harm the snake. In Sakaerat Biosphere Research Centre we offer training in handling with hooks and snake tongs. When used appropriately, these tools are better for the animals and safer for the handlers.